This website was designed to provide useful information about one of California's premier whitewater rafting rivers...the California Salmon. The Cal-Salmon is Class V and should be considered an expert's only run. The in-house web development team at All-Outdoors California Whitewater Rafting has created this website in partnership with authors Jim Cassady and Lars Holbek to serve as an educational and informational resource for guests, guides and the general whitewater rafting community. Some of the information in www.california-salmon.com was excerpted from The Best Whitewater in California by Lars Holbek and Chuck Stanley, and California Whitewater by Jim Cassady and Fryar Calhoun. 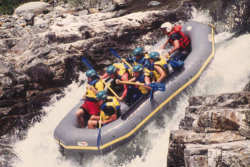 The images and graphics were provided by All-Outdoors California Whitewater Rafting. For more information about the books used to build this website go to our "About the Books" page. For more information about All-Outdoors visit our "Rafting with an Outfitter" page.